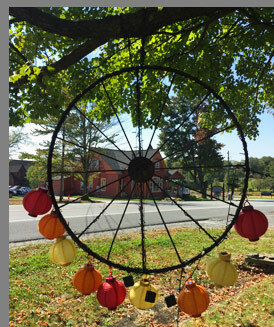 On a beautiful, warm and sunny Sunday in late September 2017, we drove to Bethel, New York to discover the Catskill Distilling Company, and found much more than we had expected. 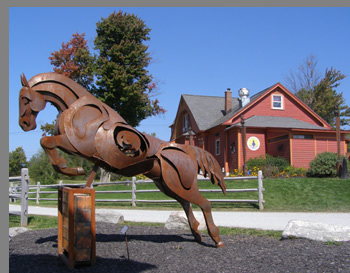 Located on a large property, a whimsical sign points the directions to their restaurant the Dancing Cat Saloon, to Woodstock, and to the distillery. 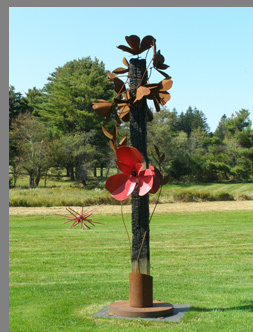 An immense sculpture garden graces the lawn with work by local artists from the Catskills and Pennsylvania, which is only 10 miles away, and chairs set around a giant firepit beckon guests to come and sit awhile and soak up the ambience. Debra's video description of the Catskill Distilling Company facilities - https://youtu.be/aQ_w90bwuTs. We met and took a tour of the distillery with Stacy Cohen, a charming blonde whirlwind of energy who owns the Catskill Distilling Company with her husband, Dr. Monte Sachs, who was an equine veterinarian before they decided to make a career change and open the distillery in 2010, becoming the first distillery to open in New York State. Monte, an American who grew up in Connecticut, fell in love with the art of distilling during his student days in Italy where he learned to make traditional Grappa. Returning to the United States to work, his passion for the art of distillation stayed with him. Like a small snowball at the top of a mountain that keeps rolling downhill and gaining size, with Stacy and Monte, a small idea grew from when she first saw a house with beautiful architectural features that had fallen on hard times, decided to buy it, remodel it, and name it the Dancing Cat Saloon. Next, they built the distillery in 2010, and together with the late world-renowned master distiller Lincoln Henderson (Brown-Forman, Woodford Reserve, Jack Daniels, and owner of Angel's Envy), created the recipes that would help define their brand, which has evolved into an award-winning company. Stacy provide Luxury Experience a behind the scene tour of the distillery, which is pristine with gorgeous copper pot stills crafted in Germany by Christian and Jacob Carl, where Monte works his magic to craft small batch artisan spirits. Committed to taking care of the environment, they use locally grown grains and botanicals in their products, pristine Catskill Mountain spring water, and the used mash goes to local farmers to be used as cattle feed. 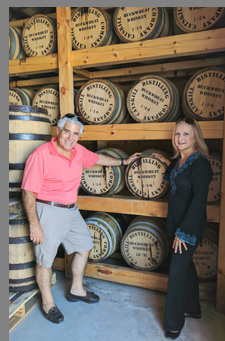 Edward and Debra in barrel storage room - CHEERS! We visited the barrel storage area where we wished the barrels pleasant dreams as they sleep in the aging process, then made our way to their comfortable tasting room and took our palates on a tasting tour with their knowledgeable bartender Colin as our "palate tour guide" who guided us through their small batch artisan product line of The Most Righteous New York State Bourbon Whiskey, Catskill Straight Rye Whiskey, Fearless Straight Wheat Whiskey, The One And Only Buckwheat, Wicked White Whiskey, Curious Gin, Peace Vodka, and Bosco Monte Vecchio Grappa. All gorgeous spirits, all sumptuous palate pleasers, and all named with references to its Woodstock legacy. After our "tasting tour," we had a delicious lunch in the Dancing Cat Saloon, where carved cat sculptures by Stacy's mom line the walkway to the restaurant, and inside, photographs by Stacy's brother Jerry Cohen, grace the walls. 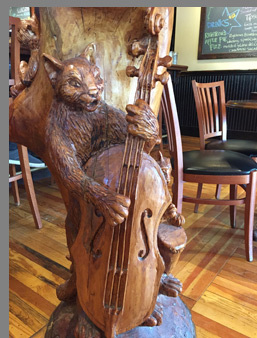 A focal point of the restaurant though is a fabulously whimsical wood column sculpture with cats playing musical instruments created by the artist Paul Stark in 2011. As it was a Sunday, there was a Jazz trio to complement the food. Interesting to note about Stacy Cohen, is that she is a talented guitarist and singer, and sings with the bands that play there in the evening. As the perfect finish to our day at the Catskill Distilling Company, we visited the Stray Cat Gallery which they opened in 2013, and were enthralled with Elliot Landy's photographs, who was the official photographer at the 1969 Woodstock festival and did album covers for the Band and Bob Dylan, and with the photographs by Jason Laure another famous band photographer. 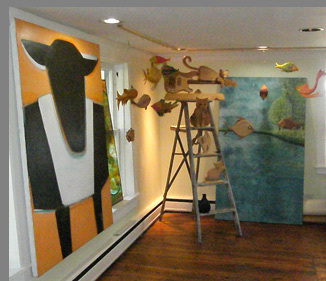 The gallery is a treasure trove of art, sculptures, and musician photographs that capture the essence of the Catskills. Our original plan was to visit the distillery tour, do a tasting, and then head home. 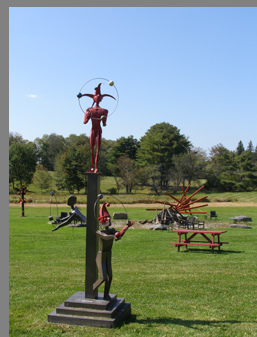 Loving the Catskill Distilling Company's ambience, we decided to stay a little longer, have lunch, and soak up the ambience of the sculpture garden and the gallery. 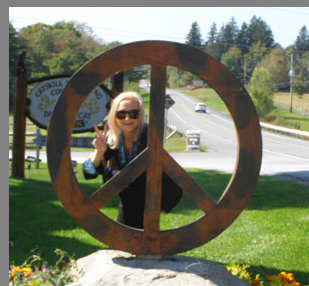 All-in-all, it was a perfect day in the Catskills and the leaves had not yet begun to don their glorious autumn colors, which provides us with another excuse (as if we needed one), to return and do it all over again. This time, we want to time our visit when Stacy will be playing guitar and singing with one of the bands. Catskill Distilling Company spirits are sold at the distillery as well in stores in the following states thus far, and growing: New York, Pennsylvania, New Jersey, Massachusetts, Maryland, Texas, Tennessee, and Washington, DC. They are also available for purchase online. If Catskill Distilling Company products are not available at your local distributor, then ask the proprietor to contact Catskill Distilling Company. 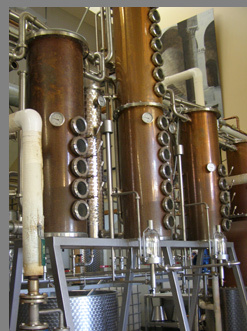 Visit their website for additional information on the Catskill Distilling Company and for stores where their products are sold, as well as online availability: www.CatskillDistilling.com. 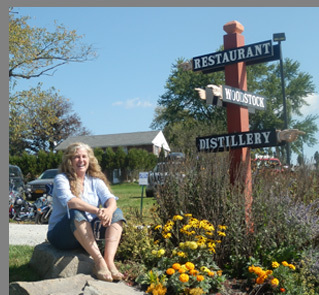 Going to be in the Catskills and want to visit the Catskill Distilling Company? The Catskill Distilling Company Distillery is open for tours and tastings daily from noon until 5:00 pm. Read about The Most Righteous New York State Bourbon Whiskey and its Luxury Experience - The Most Righteous New York State Straight Bourbon Whiskey Taste of New York State Menu in the Liquor Cabinet section. 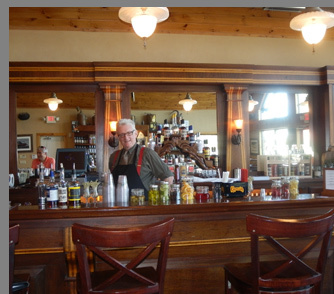 If you are feeling hungry or want to make a day out of your visit, the Dancing Cat Saloon located next door to the distillery serves lunch and dinner, and frequently has music, with co-owner Stacy Cohen singing with the band. 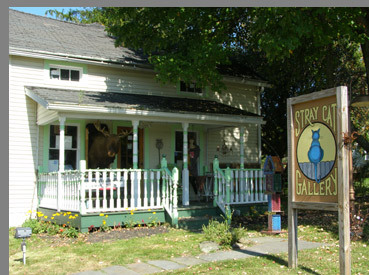 Continuing the artistic feel of the area, another great stop is their Stray Cat Gallery, located across the street from the Dancing Cat Saloon. Take NYS Thruway (I-87) North to Exit 16 (Harriman). Proceed onto Route 17 (I-86) West to Exit 104 heading west on Route 17B. Travel approximately 9 miles on Route 17B. The Distillery is on the left. 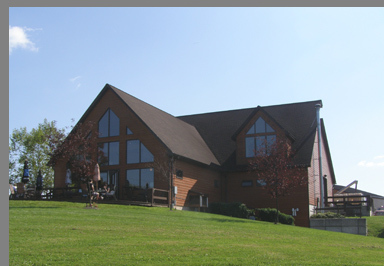 Take the NYS Thruway (I-87) to Exit 19 toward Rt-28/Kingston/Rhinecliff Bridge. Take the 1st exit onto NY-28 North at the traffic circle. Merge onto uS-209 South toward Ellenville and travel approximately 38 miles. Turn right onto Route 17 (I-86) West. Take Exit 104 heading west on Route 17B. Travel approximately 9 miles on Route 17B. The Distillery is on the left. Crossing the river at Callicoon: Turn right on Main Street and go down about two tenths of a mile to take a left turn onto Route 17B under a viaduct. Route 17B will take a sharp right after about 5 miles; drive about 1.3 miles up the hill and take a fork right merging with Rte. 52 for half a mile. There will be a traffic light; turn left and drive about five miles straight, and the Distillery will be on your right. Crossing the river at Cochecton: After coming off the bridge, drive straight for about a tenth of a mile, then turn left and drive up the hill to the intersection with Route 97. Turn left on to Route 97 for a short jog of about a tenth of a mile, then turn almost immediately on a right fork, the Old Newburgh and Cochecton Turnpike/Co. Rd. 114. Drive 4.7 miles to a traffic light, then keep on straight about five miles to the Distillery, which will be on your right. © October 2017. Luxury Experience. www.LuxuryExperience.com All rights reserved.